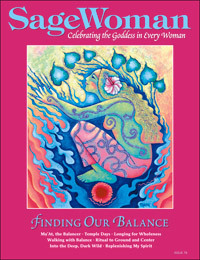 SageWoman #78 Finding Our Balance (download) [sw078e] - $6.95 : BBI Media - Magazines that feed your soul. As editor Anne Newkirk Niven remarks in her editorial, many of us tend to “work hard, play harder” but that “go, go, go” attitude doesn’t always serve us well. In this issue of SageWoman, the question is not only how do we find our balance — but even more important, how do we keep it? We begin with Cassie Premo Steele, who finds lessons on compassion (and slowness) from a very patient animal companion in "Walking with Balance" while Holly Cedar finds her path by (literally) following the sun in a daily pilgrimage that brings meaning after a bruising divorce in "Moving North." With "Into the Deep Dark Wild," Mary Reynolds Thompson muses on the relationship between discovering our creative selves and connecting with nature. Cleaning house might not seem to have much to do with keeping our souls fed, but in "The Peor Es Nada Cleaning Company" Yolanda Aleman reveals how the attitudes we take about everyday life affects our life stories, for better or worse while Jacquie Castileja Bucknell shares how she elevates the ordinary to the sacred in "Replenishing My Spirit." "You're compressing yourself," remarks a counselor to Priscilla Bergrenn-Thomas; discover how she works to expand and release her hidden dreams in "Listening to Her Voice" and join Eevie Keys in making a special day for the Goddess in "Temple Days" and Colleen Russell in recovering her life after the sudden death of her husband in "Longing for Wholeness." If there is a Goddess of Balance, muses loremistress Diana L. Paxson, it must be the Egyptian Goddess of Justice; discover her secrets (and how to work with her to bring balance into your life) in "One of Ten Thousand: Ma'at the Balancer." In this issue we welcome our newest columnist, the legendary African-American priestess Luisah Teish, to our ranks -- making thirteen regular writers to share their thoughts in every issue. In this spring issue, herbal matriarch Susun Weed describes the magic of the nightshade family, Luisah Teish shares a "Loving the Earth" ritual, Kiva Rose relates her experience in discovering her authentic nature, new mother Ella Andrews shares her love affair — with worms! — and uppity queen columnist Barbara Ardinger shares her favorite tools for rebalancing your life. Plus Ann Kreilkamp's crone wisdom, Bee Smith on the influence of the asteroid Juno, Valzora Spriggs on literal balance (yoga) and creating a wheel of life; Loba on finding our own best medicine, Z Budapest's reflections on fighting patriarchy and, last, but hardly least, solitary magic expert DeAnna Alba gives us a detailed description of the perfect ritual for deeply, truly, grounding and centering. In the whirlwind of today's hectic world, take the time to relax and drink deeply from the well of women's wisdom that is this issue of SageWoman. 96 pages, published in April of 2010.